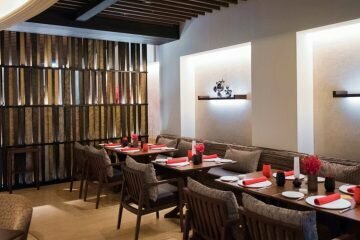 Shanghai and Steakhouse might not sound so related, yet CHAR bar and grill is over time one of the most well-known contemporary grilled restaurants among Shanghai foodies. 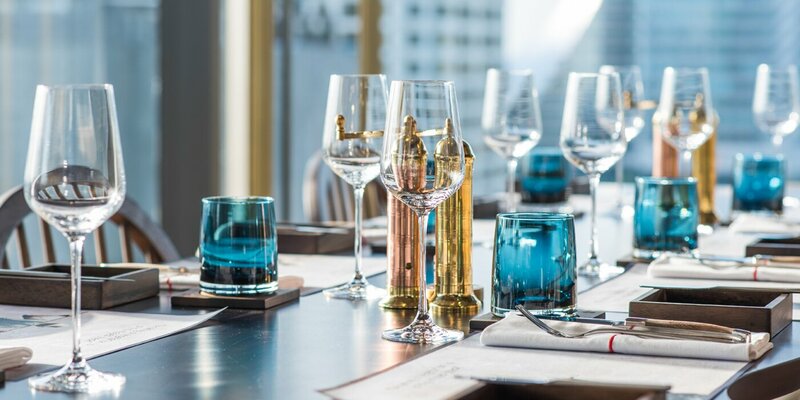 Importing ideas from the original shop, this playful name comes from the word ‘charcoal grill’ but their comfortable surrounding, friendly service, and creative, modern decoration in Blue and Gold are the real selling point. 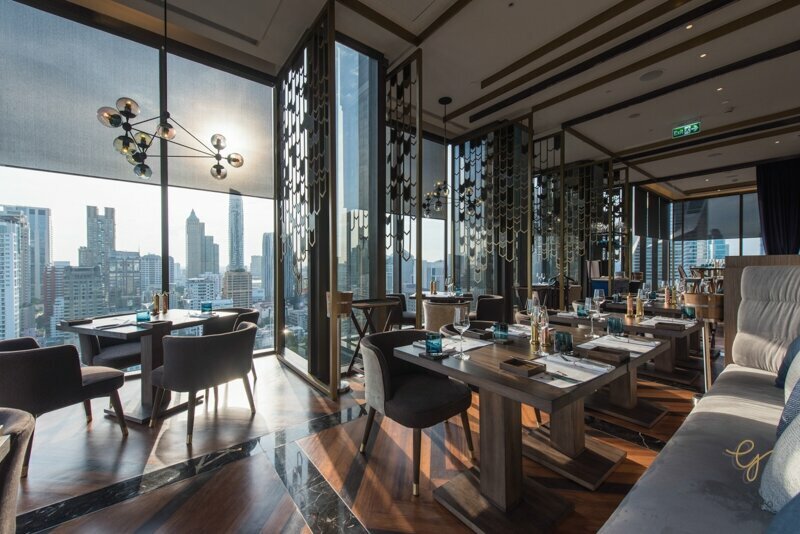 Located on the 25-26 floor of Hotel Indigo Bangkok, the restaurant is newly open from this month of June. 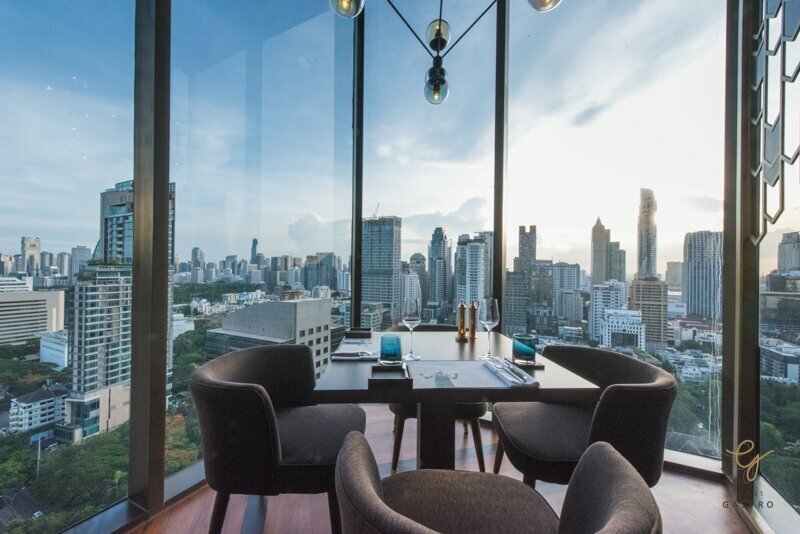 Another highlight of CHAR is a view over Bangkok, which allows an audience to enjoy a good atmosphere while having a great food. 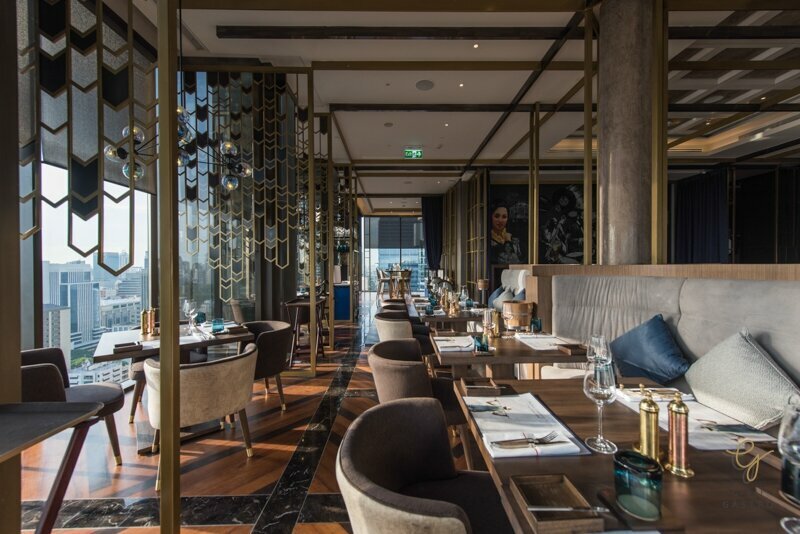 Despite CHAR restaurant, the main dining area, this exquisite place features another 2 sections: CHAR Private and CHAR Rooftop Bar. Both are stunning and magnificent. 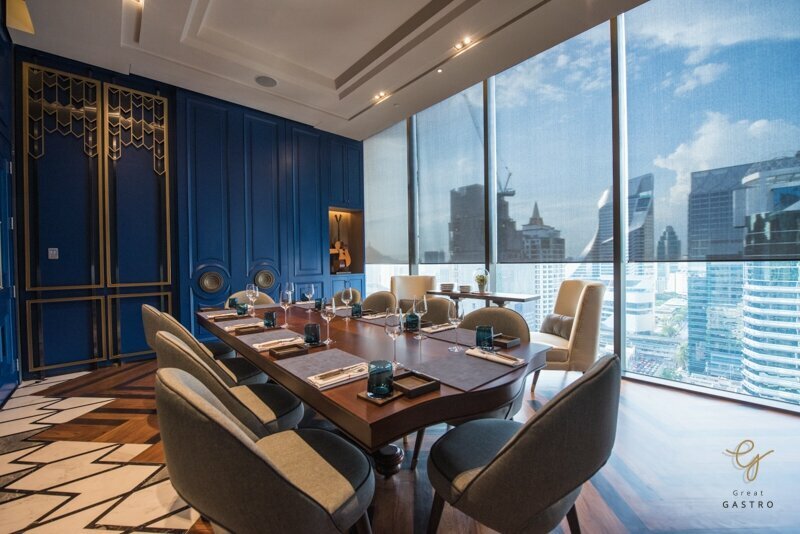 CHAR Private: for those who comes in a group, this sophisticated restaurant features private rooms. 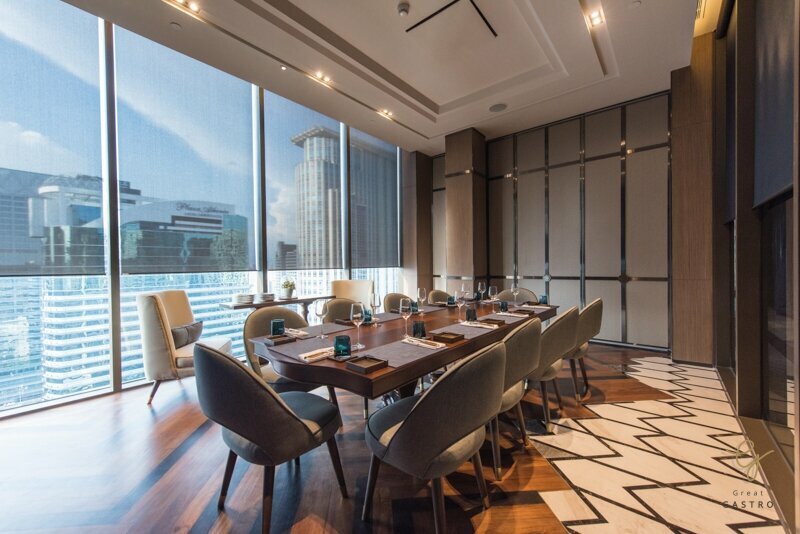 These rooms are adjusted to the center dining room and used for a larger group (up to 10 people) and private meetings. In which all importance electronic devices such as projects and Audio System are provided. 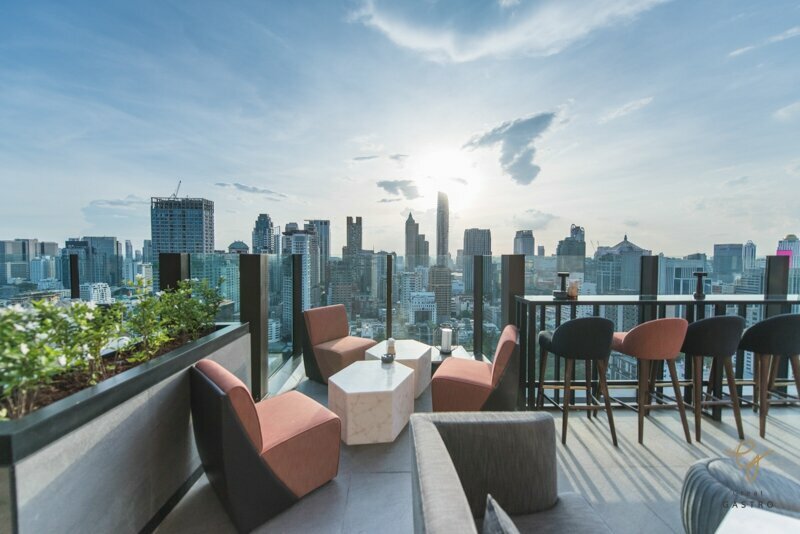 CHAR Rooftop Bar: Situated on the top floor, a stylish bar under a supervision of famous Mixologist, Francesco Moretti, features all kinds of fancy drinks from wine, beer to signature cocktails. 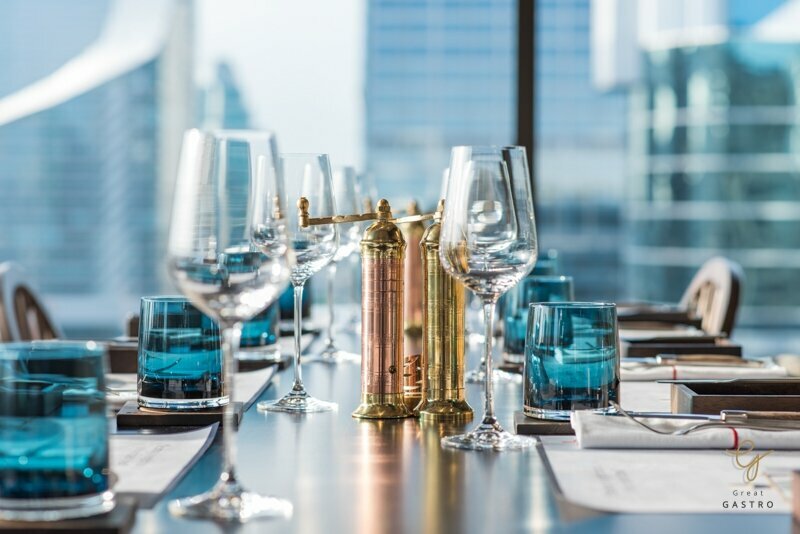 Learning with Concept Maps, ‘Every drink awakens the senses’, you can expect the best cocktails as well as the best view over the city from dawn to dusk. 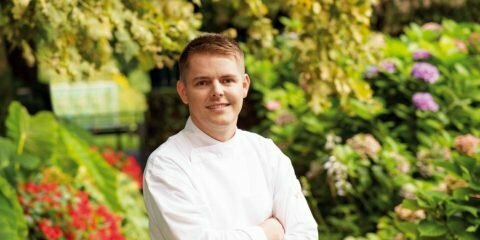 CHAR’s kitchen is under the supervision of Chef Lionel Vinatier, a young talented French chef with many years experience working with Asian dinners. 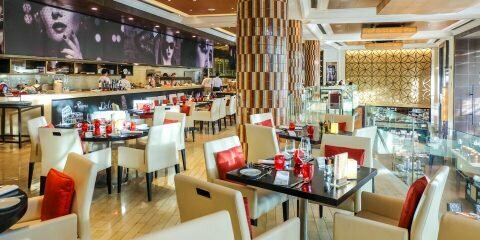 His idea of cooking is to create a great menu with no terrain boundaries under a concept of ‘a contemporary grill’. 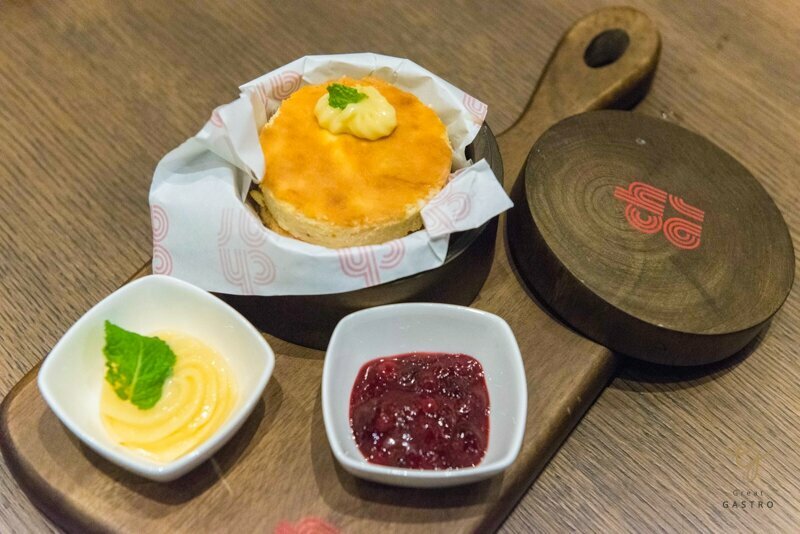 The food is not totally fine dining, taking 5 signatures dishes from the original restaurant, what mostly presented on a menu from Chef is designed to be casual and relaxing. 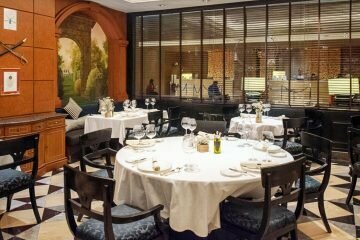 Ever since CHAR Shanghai turned up, the restaurant has been recognized widely as all-time top 20 restaurants in town. 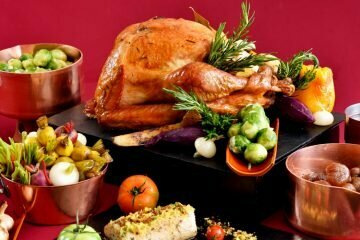 With fine qualities of foods, there is a good reason this place is top of most foodies ‘to do list’. If you want to know how good it is, follow us for more details. 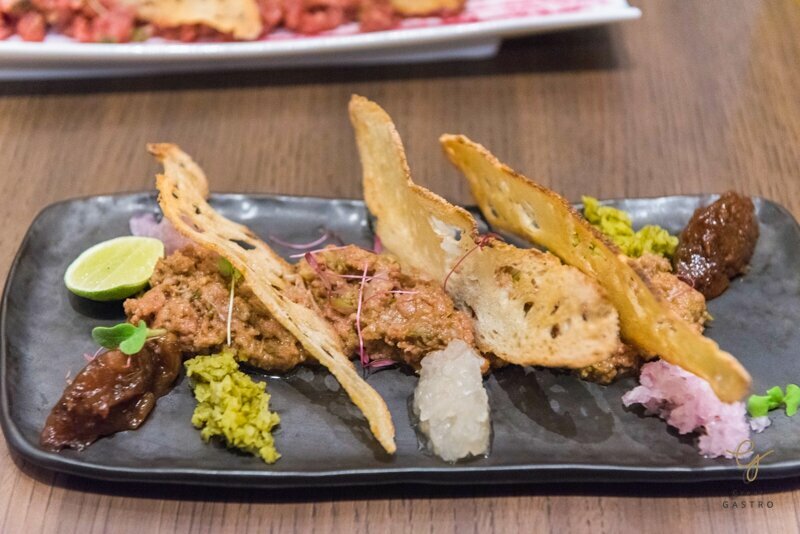 Next up was another tartar, a smoked beef tartar, a dish made of tenderloin meat seasonal up with sweet and spicy fruit mustard. This menu brings up some sense of eating a minced bologna, but with a chewy and fresh texture. 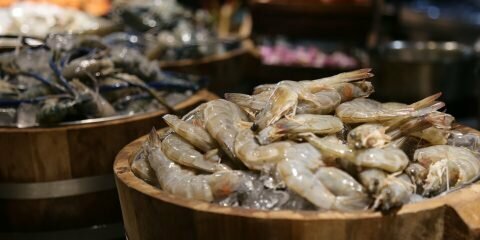 Seafood lovers would love this! 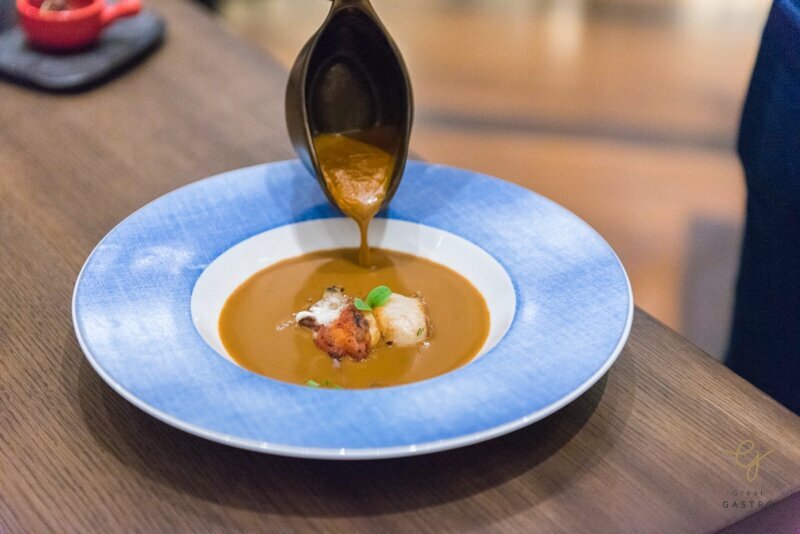 A thick and creamy lobster bisque comes with delicate flavours of the lobster enhanced with a buttery line cream, clams, and scallop. 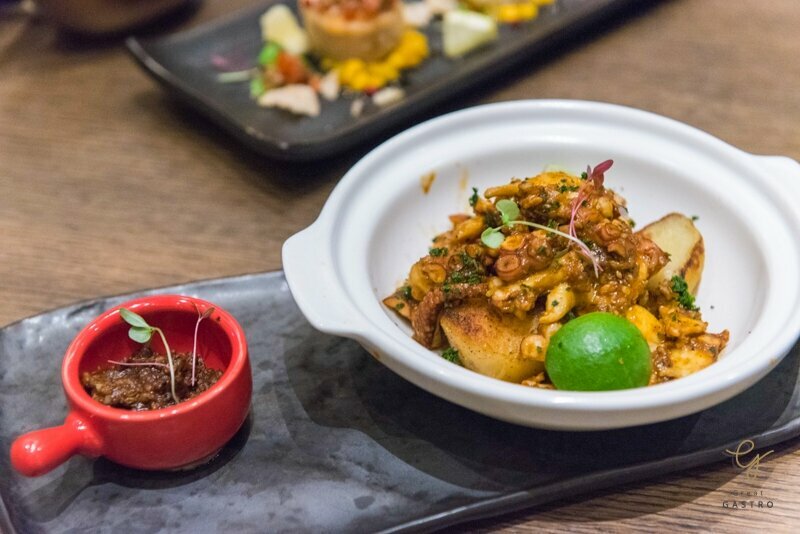 A chewy grilled octopus cooked in hot and spicy seasoning: smoked paprika, roasted chili, and pepper sauce. 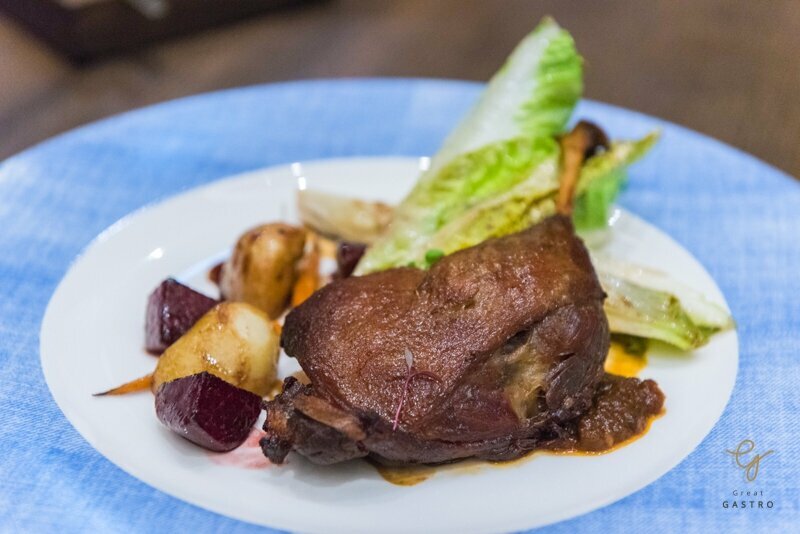 Serving in a pot, this colourful dish served with soft and sweet confit potatoes at the middle. 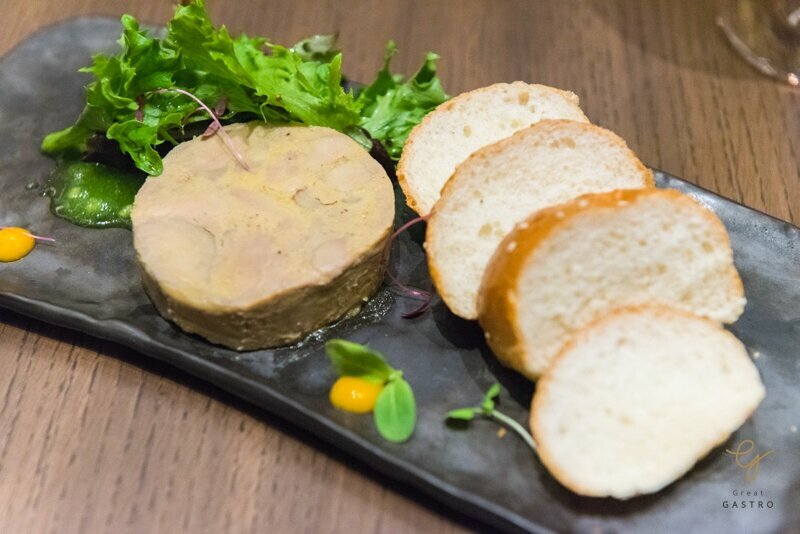 Highlighted by Chef, this delicate foie gras bakkotine is everything you expect your foie gras to be. Prepared from Chef’s secret recipe, a rich and creamy bakkotine brings balance by added a sour taste from green apple compote. 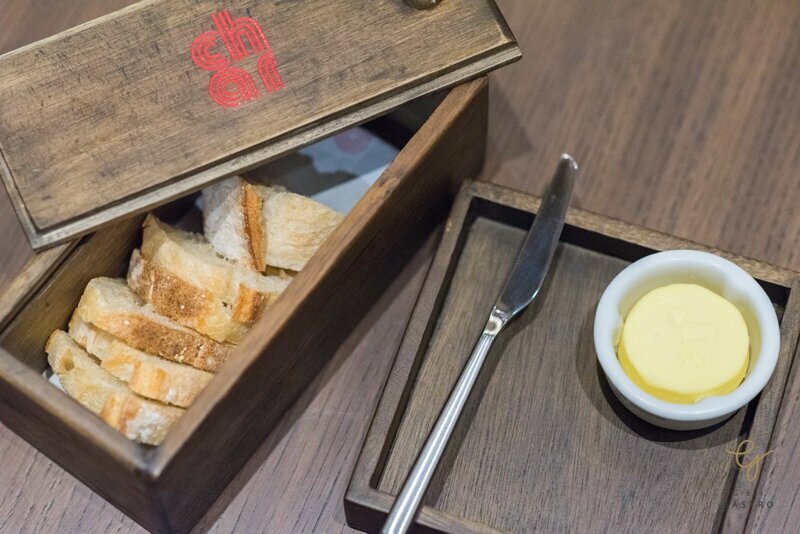 Served alongside with tender and buttery French brioche, Probably one the most impressive Chef’s foie gras bakkotine we have ever tried. 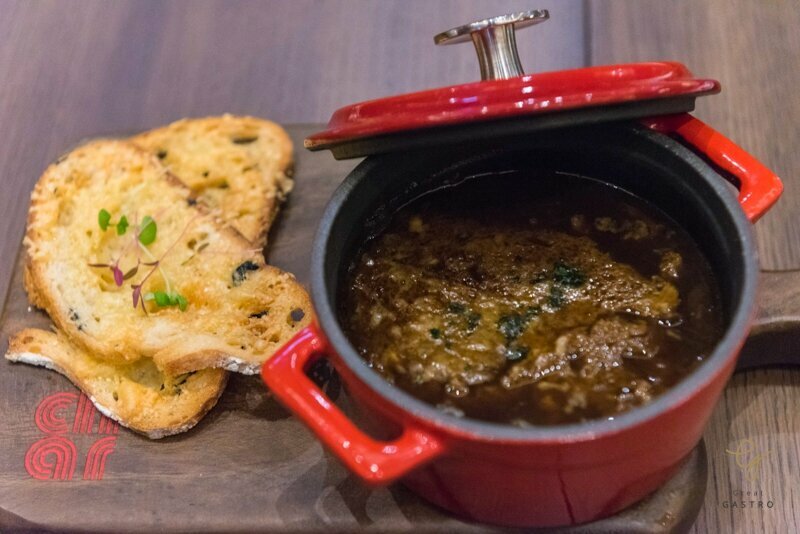 The chef may be a meat connoisseur, but he’s pretty good with seafood as well. 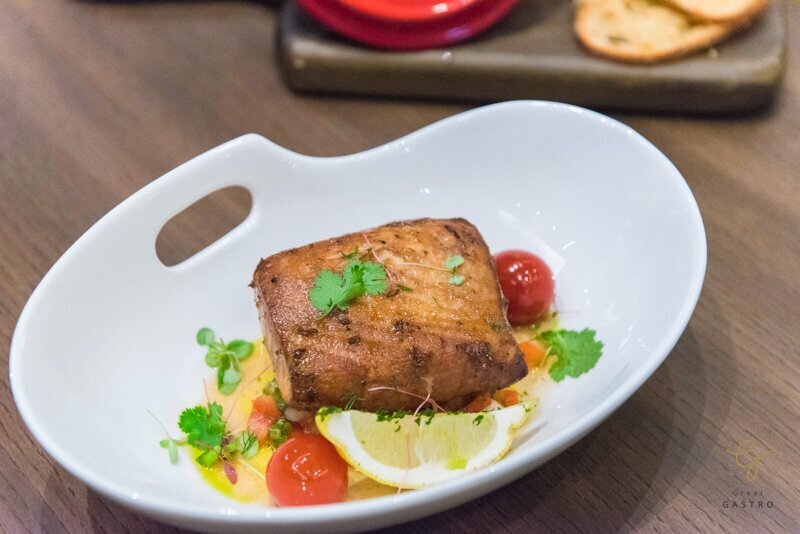 A slightly more delicate option is a North Pacific black cod stake, a delightful assortment of fresh baked fish with crispy skin and juicy meat. 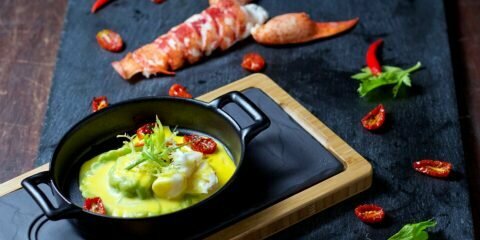 Serving in a big clay pot, a thick cut of fish fillet cooked in a spicy sauce with tomato, onion and lemon sauce. The great combination we would love you to try. Cured and cooked in its own fat for hours, this gamey piece of meat was meltingly tender. The skin was paper thin and perfectly crispy, almost hear a crack when I cut. The whole dish was outstanding. 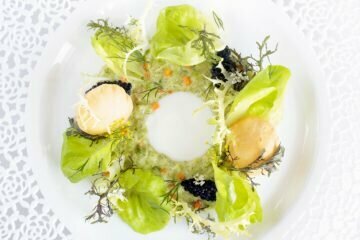 This is how we love classic French menu! A homemade ravioli fried with Lobster meat in arrabiata sauce. 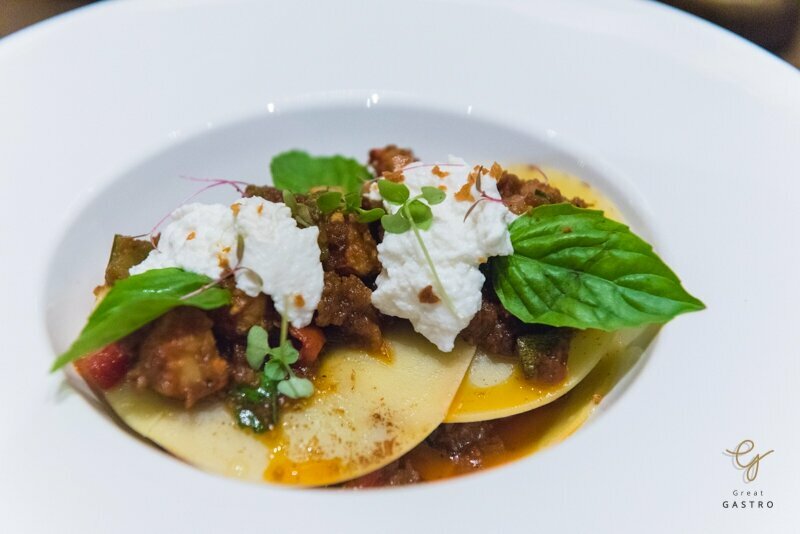 A concept of using the ravioli filling as a sauce for pasta is liberating, a sauce is spicy with a sour touch from tomato and aromatic smell of garlic. A big slice of Hanger steak arrived in nice decoration with colourful grilled vegetables: tomato, carrot, garlic etc. This steak was juicy, tender and, most importantly, bursting with flavor. Without a sauce, the meat itself is mouth-filling and rich. However, a hot and creamy pepper sauce season up a taste to another level. Cheesecake or Banana cake? Why would you have to choose if you could have them all? A banana cheesecake is a final answer! While decorated to look normal, you will actually be getting a much more intense fruit flavor on the inside: banana. 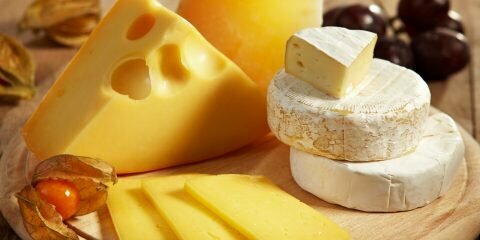 The cake is soft and tender which compliment the cheese. The Line cream and berry compote isn’t just some random cream either; it’s a delicate flavor that really matches the rest of the cake. The chocolate fan would love this! 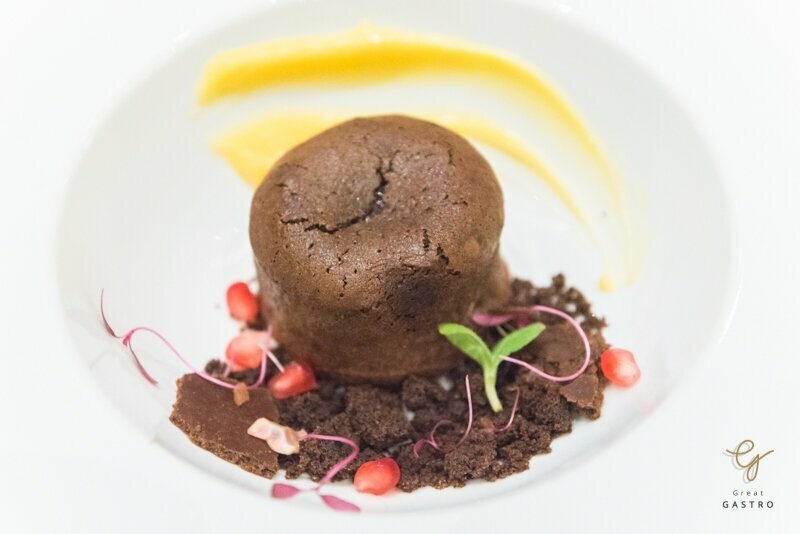 A melt-in-your-mouth chocolate fondant is totally an awesome idea for those who looking for a bitter-sweet treat after dinner. Offering a fresh-baked bread cake, the cake filled with fresh melted chocolate. This fantastic cake is rich and creamy deliciousness, a chocolatey hit. Highlighted by a chef, this lemon tart is sour lover’s best friend! covered with lemon-flavored cream and topped it off with a creamy meringue. The light, sour tang of lemon together with a crusty and buttery biscuit base should be perfect for the summer. 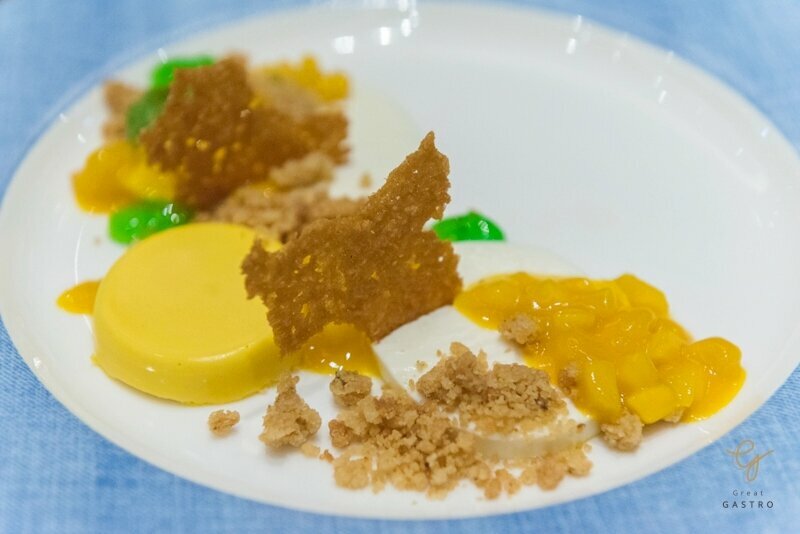 An Italian-Thai panna cotta made from cream containing mango sauce with the herby smell and decorated with a dusting of powdered biscuit. It tastes like a simple yet wholesome panna cotta infused with the fruit’s natural flavor and sweetness. Making an art out of food! 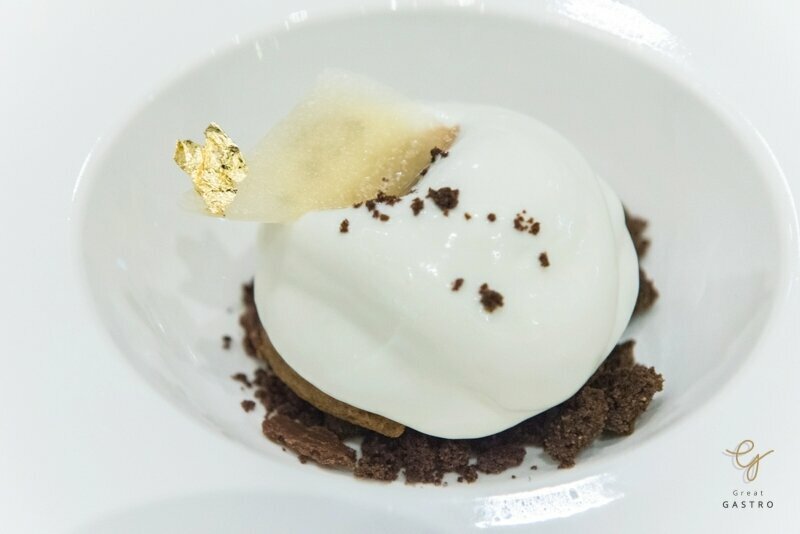 Taken from a classic flavor of all-time-famous Italian Tiramisu, this dessert classified all the ingredients into small pieces:a mascarpone definitely brought a lot to dessert by giving it more sweet and creamy taste. The coffee sponge made a perfect substitution for the biscotti. Definitely a brilliant dessert! 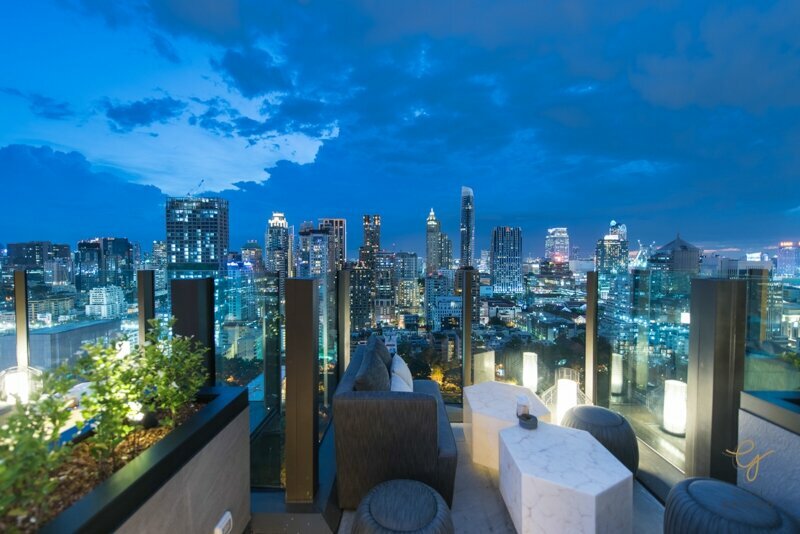 As night settles in, you might want to spend more time sip your favorite glass of cocktail on an open-air rooftop bar. 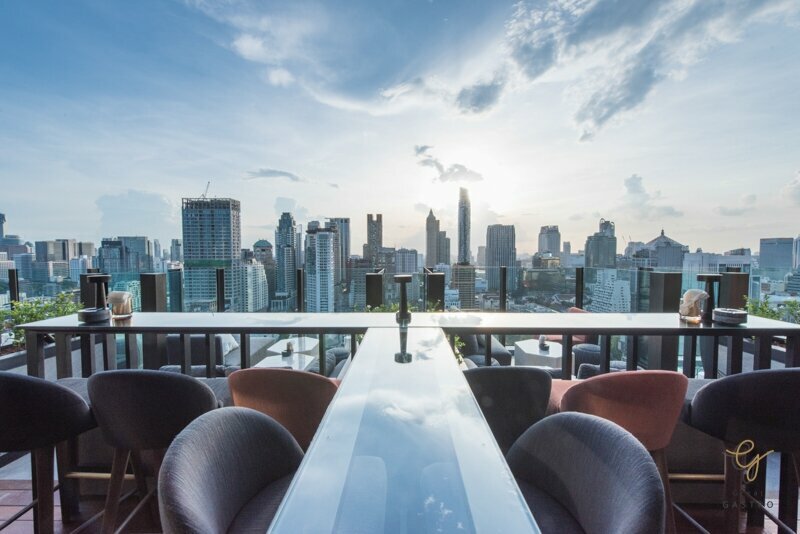 Located on a top floor of hotel Indigo CHAR bar takes on the air of casual lounge, where the post-work crowd goes to roll up sleeves and enjoy a fabulous view over Bangkok’s. The drinks list is virtually one full page of standout choices. 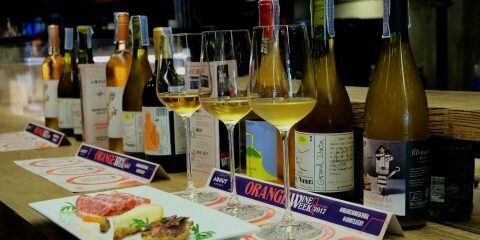 Among them, we have selected some nice cocktails as an example. 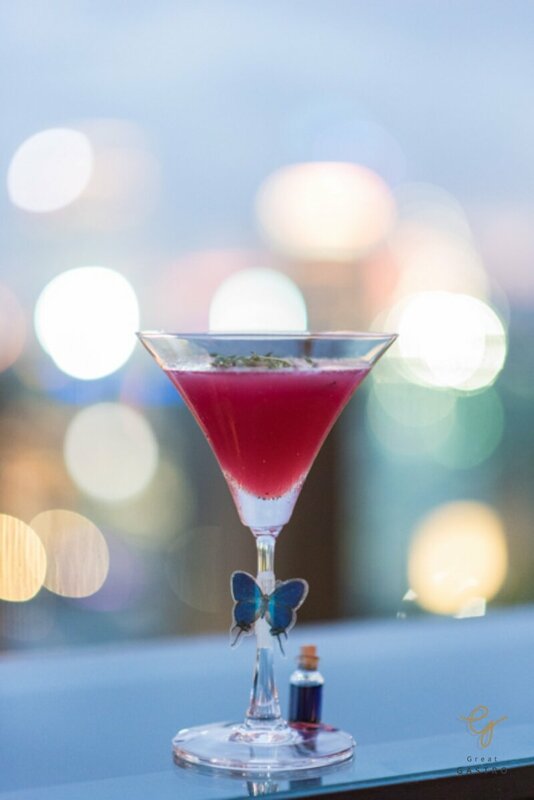 Inspired by a childhood’s memory, this sweet cocktail is a blend of lavender blue pea syrup and Absolut infused Strawberry Marshmallow. Added an egg white gives you a rich, creamy texture and a beautiful foamy. 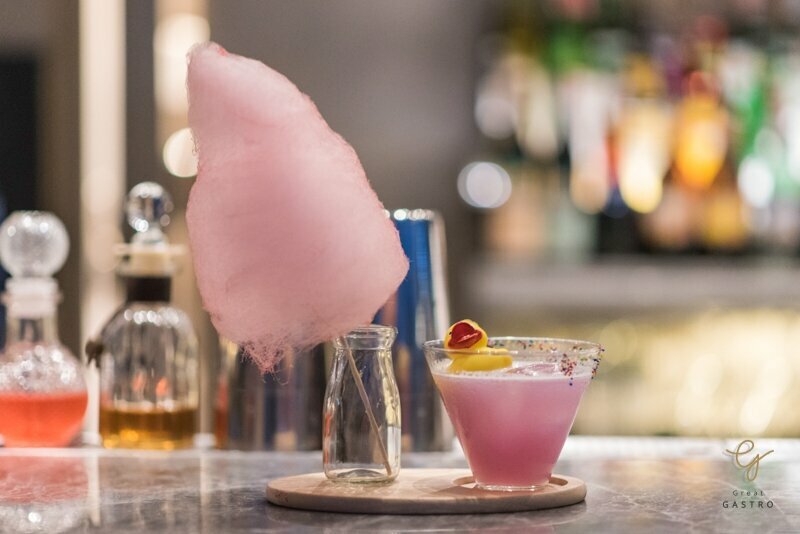 This colourful glass served on topped with a pink fluffy cotton candy, very pretty, isn’t it? A feminine mix of vanilla and thyme. This glass is tricky, you can first enjoy a sweet and sour refreshing drink before a mysterious blue liquid in a tiny glass bottle sweeps away your mood into a different chapter. Feeling adventurous? 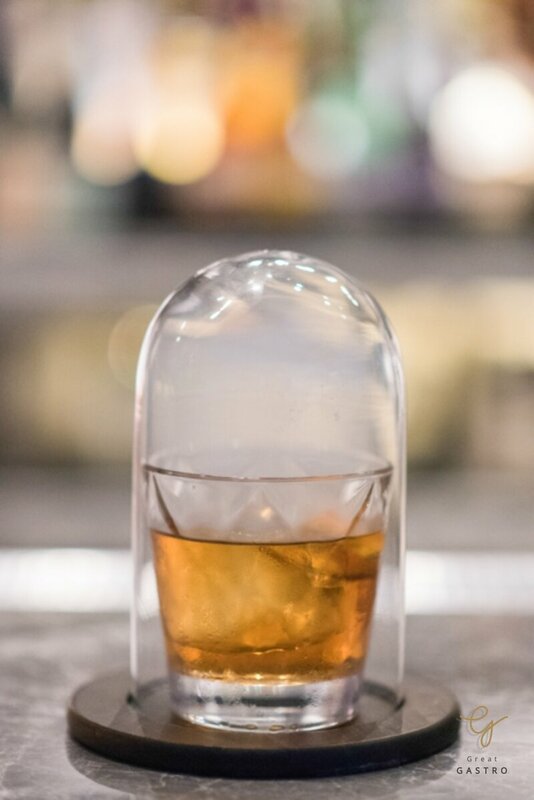 Do not miss also a Pandora’s box, which comes in a casual glass that delivers all the special perfumes and flavors from Bourbon whiskey. The taste is strong and masculine, good for those who seek for a Gorgeous and Delicious drink. 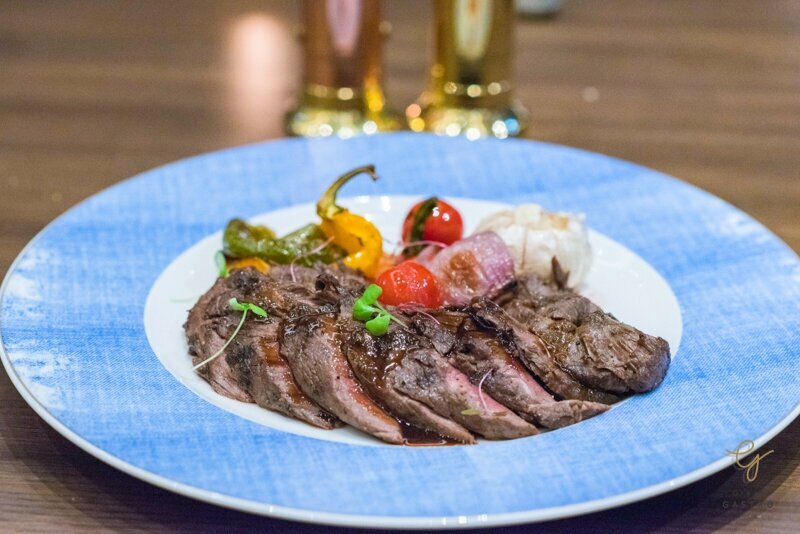 Neither a fashionable open-air rooftop bar, nor a kind of traditional fine dining steakhouse, CHAR deftly toes the line between the two milieus. 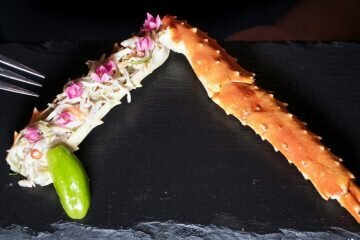 If you are searching for a perfect mixture between the quality of foods and creativity in making something new, then you end up in a right place! 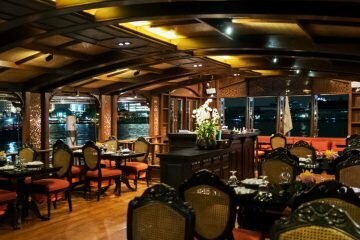 Surely known for its grilled scene, and you will find a restaurant and bar that is probably one of the most creative spots in Bangkok. 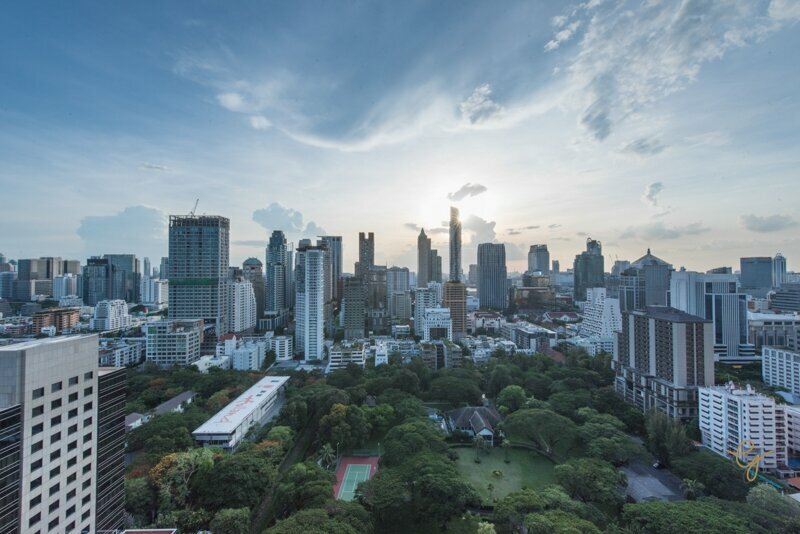 Situated on the 25 floors of Indigo hotel Bangkok. Sunday to Wednesday 18:00 – 22:30 hrs. Thursday to Saturday 18:00 – 22:30 hrs. Sunday to Wednesday 17:00 – 01:00 hrs. Thursday to Saturday 17:00 – 02:00 hrs.